Welcome to Thursday’s editorial where I feature a recipe from another blog’s creative landscape. 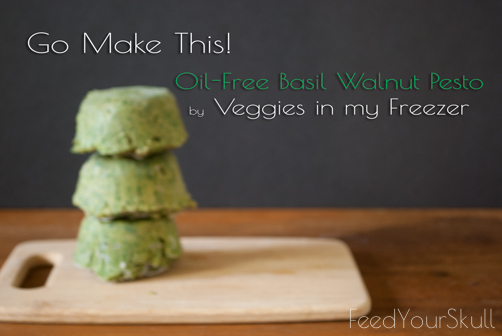 Today I’m sharing a delicious recipe I made from Veggies in my Freezer blog, Oil-Free Basil Walnut Pesto. We bought a 1/2 lb. bag of basil at the farmers market last Saturday and I wasn’t going to let it waste in the fridge pulling out a few leaves here and there. So I set out on Pinterest to find a vegan (oil-free) pesto recipe! It wasn’t long after that I found this recipe and set out to make it. It was so super easy that I made it 3 times that night! After all bulk basil requires bulk pesto, it’s like a rule of the universe or something. What do you do with bulk pesto? I lined a muffin tin with saran wrap and filled the molds with pesto and froze it overnight. Next morning, I plopped them into a ziploc bag for the freezer. Now they are in—hopefully—perfect 1/2 cup servings for a meal. Even though I had faith in an oil-free recipe for pesto I was still pleasantly surprised at how absolutely delish it turned out. Sunday night we had some over steamed swiss chard and white beans with garden tomatoes. Heavenly. The recipe called for veg broth which meant I finally tried Happy Herbivore’s ‘No Chicken Broth Powder’ – it was also amazing! I see now that the recipe isn’t on Lindsey’s site but can be found in any of her books. Leave in the comments a recipe you found this week and loved.